In 2002, I made my first proper attempt to qualify for Kona at the Llanberis Half Ironman. I got really close but was pipped to the post by three minutes for the single place assigned to my age group. The following year I used the frustration of that near miss to fuel a lot of hard training and turned the tables with a really good race at the Sherborne Half Ironman. I beat my nemesis by 15 minutes, got on the podium overall and most importantly won the only slot in my age group for Kona in October the following year. The big improvement I made was mainly down to some mildly obsessive and meticulous preparation for that one race, including a training ride around the bike course every single week of the year. I felt like my qualifying result at Sherborne had taken me to the next level of performance and that the sky was the limit from there on in. Getting the slot for Kona 2004 in August of 2003 should definitely have been a really good thing. I was already in pretty good shape and I now had 14 months to train with one goal in mind. It also gave me chance to get the funds together to make the trip to Hawaii happen, something that can often be overlooked in the excitement of earning your place! This blog really ought to be titled ‘How to go to Kona and absolutely smash it out of the park’. But, it’s not. As the title suggests, this is a cautionary tale. But I think that anyone looking for advice on how to prepare for Kona, it might be helpful. After all, learning from mistakes, and not just your own, is a fantastic way to develop. So, how badly did things go? Well, I was aiming to be in the top 10 in my age group, to go sub 9:30 or maybe even sub 9 if I could find my best form from 2003. In reality, I finished in 10:32:08, which put me 45th in my category and in 255th place overall. A long way off my expectations. For a long while I didn’t seriously analyse why my race went so badly. Whilst this was a mistake it’s probably because I was just not keen to think about it too much at all, the experience was just so disappointing. It undermined the belief that I’d gained from my performances in 2003 that I was an athlete on the way up. I did the opposite of what I’d done when I just missed out on a Kona slot in 2002. Rather than thinking about where I could improve and re-doubled my efforts to go again and get it right, I just parked the episode and moved on without wanting to pick over the painful details. I’ve still got my finisher’s t-shirt and it’s one of the very few race t-shirts that hasn’t been consigned to bike cleaning duties. But, it’s been tucked away in a drawer and I honestly don’t think I’ve ever worn it, which I guess is because I didn’t want to remind myself of the event. But, thankfully, reflecting on what happened has got easier as time has gone on and I think there are a few key reasons why my Kona experience did not go as I hoped. I was certainly excited to have qualified early and felt I was going to have a great build up to race day. However, things did not go well, mostly due to my own decisions and a bit of bad luck. Because my relative success in 2003 was built on a dramatic increase in training volume and intensity versus the previous year, I mistakenly tried to apply a similar formula in the build up to Kona. With hindsight, I can see that this backfired spectacularly as I’d clearly already started to get near the ceiling of my capacity to absorb and adapt to my training load in 2003 and the further increase simply sent me over the edge into over-training and, inevitably, injury relatively early in 2004. Having 14 months to prepare for Kona should be beneficial, but the way I managed my build up was certainly not. I naively assumed I could draw a linear graph of continuous improvement between August 2003 and October 2004 and just layer more and more training and races in to keep on heading on that trajectory. In reality, this meant that by about May 2004 I was burning out. I had numerous niggling injuries, the worst being an ITB tendon issue in my left knee that never truly went away for the rest of the year. By July I was feeling generally frazzled and frustrated. I limped through August and September on haphazard training, showing up in Kona having barely run for eight weeks and with little idea of where my actual fitness and performance level was in relation to being able to execute a 9 plus hour event. If you’ve already qualified for the Ironman World Championships in 2017, avoiding the temptation to over-train and risk burning out is the number one piece of advice I’d give you. I arrived in Kona eight days before the race and things didn’t get off on the right foot. It was awesome collecting my bags from the outdoor baggage carousel at the airport and getting another Lei as a welcome to the island. But unfortunately, my bike box failed to turn up with me. This made my first few days on the Island a tad more stressful than they should have been. I cracked on with swim training and did some running, but had to head to the airport each day to see if my bike had shown up. It eventually did about three days before the race and so I only had a couple of days to do any riding before racking it in T1. Worse still, my power meter was broken so I would have to ride without the feedback I’d been training with and that I had planned for in my race strategy. I went on an ill-advised goose chase around the bike shops of the island where I wasted time and energy trying to find non-existent spare parts for the European-made meter when I should have been training and resting up. Even though I could not have prevented this happening, I should have thought about taking some basic spares for the unit with me in case something went wrong. Power meters were still pretty rare in 2004 and I should have anticipated that getting the spares in Hawaii would be nigh on impossible. In the days leading up to the race I also drank a lot of water. This was because I was really paranoid about dehydration given the heat and humidity. I tried to ‘get ahead of the game’ by drinking until my pee was clear the whole time, which proved to be a big mistake. I’ve since written about drinking too much water pre race in quite a lot of detail. Looking back, this was probably one of the first times I did it myself to a such an extent and it certainly contributed to my bad performance. Amazingly, I still regularly hear of athletes doing the same thing now, even pros, and knowing that it happens just because of ignorance and nerves is really frustrating, as it’s really an easy problem to solve with some basic education on the science of hydration. (Full disclosure here: once my racing days were behind me I applied what I learned about hydration to setting up a sports drinks company called Precision Hydration). The other counter-productive thing I did in the days before the race was to get unrealistically ambitious about my performance. My training had been massively disrupted by illness and injury and I hadn’t really raced that well all year; but I guess I got a bit carried away with the whole Kona atmosphere. I put that down to the remarkable innate human ability to convince ourselves that something we want really, really badly is possible, even when the odds are clearly stacked against it happening! I’m not saying don’t enjoy and get inspired by the fantastic vibe around the event. But whilst a healthy dose of optimism, ambition, and a positive outlook are essential for performing well in any long endurance event, these traits need to be balanced by a dose of realism and they should be aligned with an executable race plan. I genuinely showed up in Hawaii with only the vaguest impression of how I might get on due to such a disrupted build up. Instead of then managing my own expectations, I allowed myself to get caught up in the buzz of the place and started to believe that maybe the last few months has been a bad dream and that I still had the form and fitness that I’d shown 14 months before. All this meant was that I was not prepared in any way to be patient, or to deal with what was in fact always likely to be an extremely tough day mentally. It seems obvious now that even fully fit I’d have had my work cut out meeting my expectations, as clearly everyone tries to bring their A game to Kona, and many succeed in doing so. It is the World Championships after all! I had turned up with my B (or maybe even C) game yet had set out hoping that my A game would just show up unannounced. I’d have been better off setting a concrete but realistic goal and racing to achieve that rather than just ‘hitting and hoping’. During the race itself, there were several mistakes I made. Had not made the mistakes I did when preparing, I may have made better decisions. The swim was one of the only things that went pretty well on the day. I think that 2004 might have been the last time there was a true mass start in Kona. All categories, pro, age group, male and female started at exactly the same moment! I remember positioning myself right at the front of the pack of 1500 or so athletes, spotting some of the top pros around me. Treading water waiting for the cannon to go off with those guys, that was a great feeling. I kind of understand why they’ve chosen to break the start up these days, but it is a shame they have to do this as I think it impacts the spectacle and experience of it. When I set off, I knew I was going off head to head with the very best in the world. Because of the high risk of sunburn on the bike there are a load of helpers lathering sun cream on any exposed flesh as you grab your T1 bag at the pier in Kona. It’s an odd experience! Once I’d been suitably greased up, I collected my bike and set off. I was conscious that as I was without my power meter, I’d be better off riding conservatively for the first few miles as it can be easy to overcook the first few miles. I did have a speedometer working though and was mildly surprised to be doing about 25mph. I was feeling ‘easy’ but I was being overtaken constantly in those opening few miles. This probably lead me to riding a bit too hard as I got carried away trying not to lose too many places, even though deep down I probably realised I was overdoing it. My abiding memory of hitting the main Queen K highway is that the temperature was rising and rising. 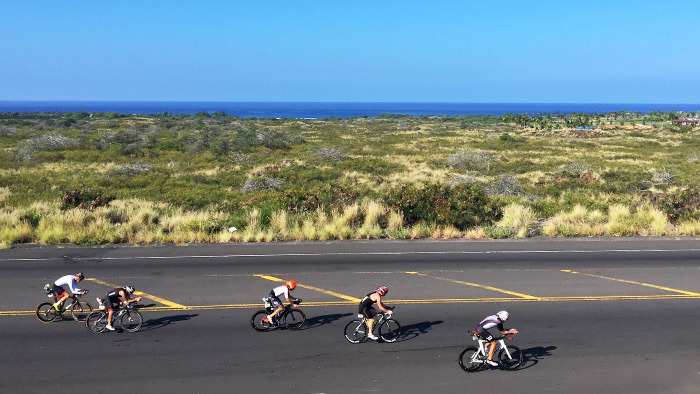 It felt like riding into a pizza oven whenever the course dropped down into one of the numerous dips on the Queen K. I felt ok(ish) for the first couple of hours but then started to find that I was being overtaken constantly. It was frustrating but I didn’t feel like I could push any harder and so there was little I could do about it. On the climb and descent either side of the turnaround point at Hawi half way into the bike, I really started feeling ropey. I had a headache, slight nausea and a bit of a bloated stomach. ‘I must be getting dehydrated’ I thought. So I made an effort to drink more and more Gatorade and water, as that was what was being given out at the aid stations. Despite drinking a lot I just got weaker and weaker and I started getting nips of cramp in my quads and calves on the climbs. By about the 90 mile point I had completely stopped caring about the now non-stop train of athletes spinning past me. I must have been in about 300th place by this point, having started the ride just outside the top 50. My bike time ended up being just shy of 05:54 and I had dropped down to 446th overall- not what I had had in mind. I honestly can’t recall whether I thought about giving up and not finishing on that hellish ride. But if I did, any notion of throwing in the towel was quashed by the buzz and noise there was coming back into T2 in Kona. I was also just delighted to get off my bloody bike and start running! I did still feel a bit bloated and sick but was not moving too badly, with all things considered. I stopped eating and drinking anything on the run as I simply couldn’t face it. Although I didn’t feel amazing, I managed to keep tapping out a steady pace, rather than slowing to a jog or walk. By the mid way point of the marathon I was actually moving forwards through the field. I was not making spectacular progress but I was going past a lot more people than where going past me at least. At some point my stomach eased a bit and I settled on the idea that small sips of coke and a few salty pretzels from the aid stations were what my body was willing to tolerate. These basically got me through the entire run from a nutritional point of view! After about three and a half hours on my feet I remember the immediate approach to the finish on All’i Drive very clearly. Hearing the noise from the commentary and all of the spectators gives you a real shot of adrenaline. I actually felt my skin prickle a bit. Even though my performance was way worse than I’d hoped for, I did enjoy the final few meters coming down the chute as the announcer did the whole, ‘Andy Blow you are an Ironman’ bit. Although I’d done the distance before, it sort of felt like doing it in Kona was when you became an Ironman ‘for real’ and I was pleased to have been able to experience it first hand. In the end I ran a 3:33 marathon (about 30 min down on what I’d have expected on a good day). A far cry from what I should have been able to do. After the finish I sat in the recovery area and ate free Dominos pizza and ice cream for a while. I was just glad it was all over to be perfectly honest! That night I suffered a truly horrible night of cramping up in bed. I barely slept a wink and must have got up to pee about every 40 minutes whilst dealing with a thumping headache and fever. I now know that one of the reasons for my poor performance and post race symptoms is I was suffering with mild hyponatremia (dilution of my blood sodium levels), caused by a combination of drinking too much water in the build up to the race, having salty sweat (I lose 1842mg of sodium per litre but was unaware of this at the time) and over-consuming Gatorade and water during the middle part of the bike course. I’ve done plenty of research on the topic of hyponatremia since and when I look back, I realise that this was one of the first times I experienced it first hand. It made me as sick as a dog for two days after the race. Of course on the way home the airline had no trouble getting my bike back to the UK at the same time as me, which felt a little bit ironic as I basically wanted to sell it and never ride it again that point. I did carry on racing after that. I went into the pro division in 2005/06 and actually had some decent results and even earned a Kona slot a few more times. I turned them down, telling myself I couldn’t afford to go. When I look back now, I’m not all that sure that money was the real reason. People often say I should have another crack and, when it comes to Kona, I’ll never say never. I’m thinking I’ll try and stay fit and healthy enough to have another go when I get to the 80-84 bracket as I heard there were only two competitors in it last year and I like the sound of those odds. To anyone reading this in your hotel on the Big Island, I wish you the very best of luck and I hope that your performance matches your expectations, whatever they may be.